A Scanning Tunneling Micoscope (STM) in principle shows the topography of the sample being scanned, down to atomic dimensions. But this description is only a good appoximation, in reality the electronic structure of the sample plays an important role in the imaging process. 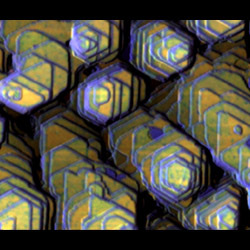 This fact can be used to obtain STM- images in color, with these images not only being very aesthetical, but with the color variations representing varying electronic structures of the sample surface. Surface of a 10 monolayer thick island of Tb on W(110). The green region is the clean Tb(0001) surface, while the blue-violet region is an adsorbate induced reconstruction of the Tb(0001) surface. The adsorbates, possibly CO, result from impurities from the evaporant, since the degassing (cleaning) process of the Tb evaporation-source had not been finished as this sample was prepared. 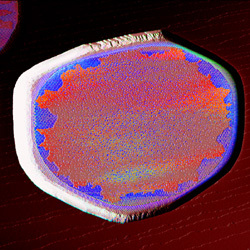 Sample: Crystallites or "islands" of GdFe2, prepared by simultanously evaporating Gd and Fe onto the W(110) substrate and annealing at 430°C. The left island is 2.8 nm thick. Among the islands, the substrate is covered with a monolayer of GdFe2. The GdFe2 monolayer exhibits a slightly different color than the GdFe2 of the islands, what means, that the electronic structures are different. The reason is the monolayer being stressed by the underlying W(110) substrate, with a continous stress release to the thicker islands. 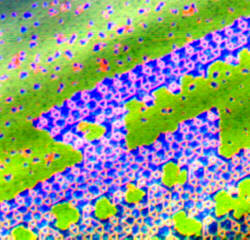 Sample: About 4 monolayers of Tb on W(110), annealed at 330°C. At these temper-parameters, the islands mainly grow along the substrate steps. Among the islands, the substrate is covered with a monolayer of Tb. The blue regions are hydrogen being absorbed on top of the surface. Hydrogen is always present in small amounts in the ultra-high vacuum chamber. 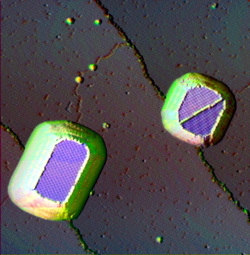 About 0.3 Monolayer of Tb, less than a closed layer, have been evaporated on top of the W(110) single crystal. The Tb atoms arrange in different, particularely chain-like superstructures. 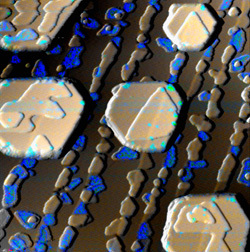 The varying inter-chain distance alone leads to different electronic structures of the Tb atoms and therefore different colors of the superstructures in these images. Island of Tb on W(110). Again an insufficient degassing process of the evaporant Tb leads to the colorful, but otherwise unwanted adsorbed contamination at the rim of the island. 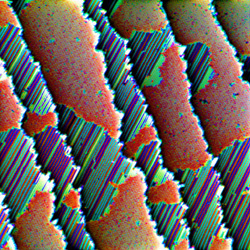 Tb terraces on W(110); during the evaporation process the substrate temperature was lowered from 350 to 300 °C, resulting in the formation of such step pyramid like structures, with each step being only one single atomic layer (0.28 nm) high. 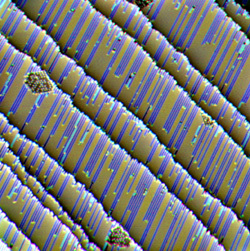 Beside hydrogen adsorbtion sites (blue) the terraces exhibit two kind of regions of slightly different color, yellowish and greenish. The difference is due to stacking faults that are present in the Tb(0001) surface. Gd- Islands on W(110). In the blue regions hydrogen has been adsorbed on top of th Gd surface. 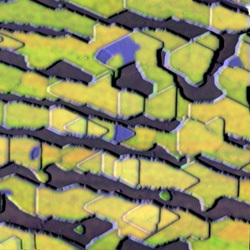 The many small second monlayer islands seem to be more sensitive to hydrogen adsorbtion than the thicker ones, since hydrogen has adsorbed preferentially on them. The reason that the color-information is dominated by the hydrogen signal in this image lies in the very high tunneling bias of the three color channels. Gd and Fe have been evaporated in relation of 1:1 on top of the W(110) single crystal, resulting in in the formation of a GdFe2 alloy, visible as the olive-green regions. The surplus of Gd results in the formation of the typical Gd on W(110) superstructure, visible as the blue regions. Most of the technical terms are explained in a glossary.